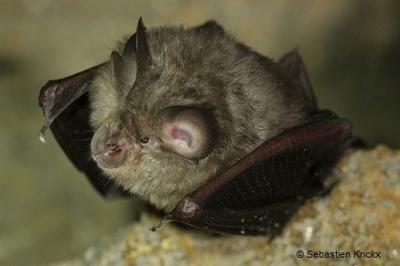 The Lesser Horseshoe bat is the smallest European horseshoe bat with a wingspan of 190-254 mm. It has soft, fluffy brown fur, small strong feet and very broad, rounded wings, with which it wraps itself during hibernation. It can be distinguished from other Rhinolophidae not only because of its size but also because of its longer and pointier sella tip. Distributed across most of Europe, it can be found in warmer regions with woodlands, riparian forests and pastures. The selection of roosts depends on the temperature; large rock crevices and attics of buildings are chosen for summer, while caves, tunnels and mines are used during winter. Maternity colonies can reach 500 individuals but these hang individually and not in clusters. R. hipposideros are very agile, which allows them to quickly narrow the distance between them and their prey. While in flight, they are able to glean crane-flies, lacewings, moths and spiders from branches. Similarly to other Rhinolophidae, the Lesser Horseshoe bat is rather sedentary and the average distance between its roosts ranges from 5-50 km. Longer migrations have also been recorded. 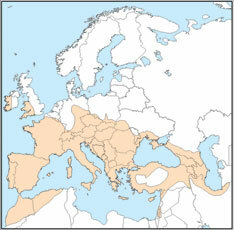 R. hipposideros is widely distributed and can be found in all European countries (also islands) of the Mediterranean region. In North Africa it is recorded from Morocco, Algeria, Tunisia and the eastern part of the Sinai (to Egypt). The Lesser Horseshoe bat faces threats such as the fragmentation and isolation of habitats, the disturbance and loss of underground habitats and the loss of attics (through loft conversions in human homes). Other threats include the effects of pesticides and agricultural intensification.